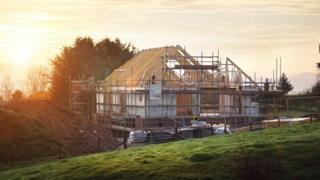 Image caption The council said it believed its plans were "incredibly ambitious" but "incredibly deliverable"
Councillors have endorsed a five-year plan which could see nearly 1,200 new affordable homes built in the Borders over the next five years. Councillor Mark Rowley said there had been about 800 built over the previous 10 years. The plan is based on anticipated funding and tackling all "land and infrastructure challenges". Mr Rowley, who is executive member for business and economic development, said it was "very exciting for lots of people". "Over the last 10 years we have delivered about 800 affordable homes so this is significantly ramping it up," he said. "Officers have put in a huge amount of work with lots of partners - including the registered social landlords - to identify sites right across the Borders that are highly deliverable." He said work was already under way on a number of sites to ensure the target home numbers could be reached. "We think it is incredibly ambitious but we also think it is incredibly deliverable," he added.